I was intrigued to read an article in the Edinburgh Evening News today about how the comedian Kevin Bridges had a night of his sell-out tour ruined by hecklers constantly, well, er… heckling during his performance at the Edinburgh Playhouse recently. The article’s author, Brian Ferguson, who was in attendance said, “Frankly, it was the worst-behaved audience I had witnessed in 25 years of attending events.” For those watching, solely to be entertained by Kevin’s latest stand-up tour (as well they might have not unreasonably expected), having forked out £30 for the privilege, it was probably a night to forget. Is this just a problem for Kevin Bridges though? Perhaps the demographic he appeals to is that of a loudmouth, drunken, lout? It appears not! Brennan Reece was “throttled” in Northwich, police had to remove a man disrupting Celia Pacquola’s set in South Wales and Michael McIntyre had his show interrupted in Darlington by a woman who “kept using her phone”. Trawling the internet there are thousands of instances of disrupting audience members. Of course, there have always been hecklers, but more recently there seems to have been a slip in what some people deem to be acceptable behaviour. Some of this is encouraged by venues who allow taking drinks into gigs as well as serving them beforehand and during the interval which leads to anything from people wandering in and out to go to the toilet during a performance to the kind of behaviour seen in Edinburgh. It’s almost as if some people seem to have forgotten basic manners and can’t actually distinguish what may or may not be just plain rude. It’s a cultural shift which is not just affecting comedy gigs, but other areas of our lives too. Indeed, in some cases this shift has been encouraged and actively courted. Darts for example. 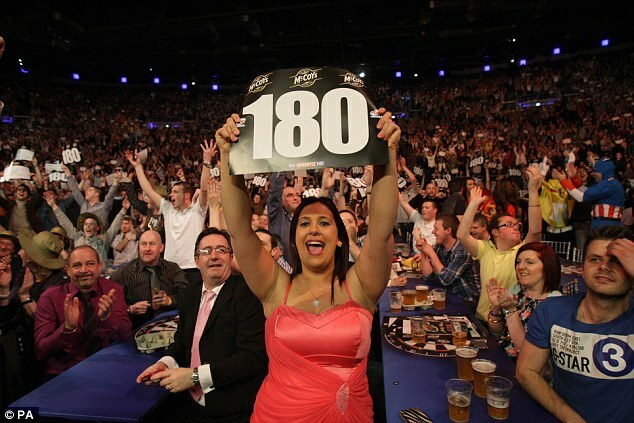 The sport of darts was losing appeal, viewers and sponsors at a rapid rate during the late 80’s and early 90’s. Nowadays, it’s big business, largely thanks to the promotional skills of Barry Hearn. The Premier League of Darts sees the big arenas sold-out across the country to watch the likes of Phil “The Power” Taylor and “Mighty” Michael van Gerwen. The TV coverage has blossomed and there is no doubt that interest in the game has hit new heights. I love darts but I can hardly watch it now as an ignorant mass, barely watch the game, (in fairness there’s not much you can see in such a large venue, especially when you’re pissed!) dressed in their comedy fancy dress, with their hilarious home made placards, drinking, screaming, chanting and at times abusing players throughout the game. Quite often timing their collective wisdom of jeers and bully-boy booing directly when a player is throwing or about to throw. Yes, darts is popular and growing and has a massive appeal, making lots of money. Is it actually better off for it though in sporting terms? Not for me it isn’t. It’s sold itself down the river to the lowest common denominator and is contributing to a cultural dumbing down of what’s become acceptable. Sadly other sports also seem to be following darts’ lead. The word “sport” will soon be a misnomer, unless preceded by the word “blood” as any sense of “sporting” behaviour and respect dies a very ugly death. Elsewhere, ITV’s X Factor has provided some of the most uncomfortable viewing seen on British television since Keith Chegwin stripped off in “Naked Jungle”. The “Six Chair Challenge” section of the auditions process has been just short of a scene from the Hunger Games. It has been brutal. Again, a hyped up crowd seemingly completely comfortable to take part in a collective blood-letting, screaming abuse at contestants for telly ratings. Is it any wonder that in Great Britain in 2015 someone can feel completely comfortable, on a packed bus, to scream racist abuse at an elderly man with a walking frame or a woman on an equally crowded bus feels equally as comfortable racially abusing a pregnant woman? You may sneer at the link I’ve suggested, just then, between comedy shows, sport, television and two criminal instances of racist abuse. The point I’m making though is that in our daily lives, the line about what we deem as acceptable through our popular cultural influences is being degraded. What was once rude, unsporting or vulgar is beginning to become almost normal. Check out social media. Facebook and Twitter regularly indicates what a growing minority deem as an acceptable way to engage with others. It’s often not very pretty. More “out of order” than “best of order” you might say.